STIPA Consultancy&Ecotourism with the Superior Institute of Environment present the first course "Ecotourism: Design and Marketing Products". In the last decade, Spain has begun to speak more often the concept of "ecotourism". Tourism that aims to be a memorable experience for discovering and know the most valuable natural places. Therefore, ecotourism allows different groups of tourists a direct and personal contact with the natural and cultural heritage in each destiny; as well as to expanding and enriching the way of thinking and values for visitors. We have a high potential in Spain, which is the quite diverse network of natural areas, as well as a key role in biodiversity in Europe. Ecotourism can be an activity that serves to preserve these natural and protected areas, understood as a tool that supports job creation and local economies that promotes active participation in conservation in the tourism sector. But one of the biggest weaknesses of many territories and local businesses is that their lack of attractive tourism products. This situation does not help to have any chance of competitiveness and differentiation in a tourist market that tends to diversification and specialization in sustainability. 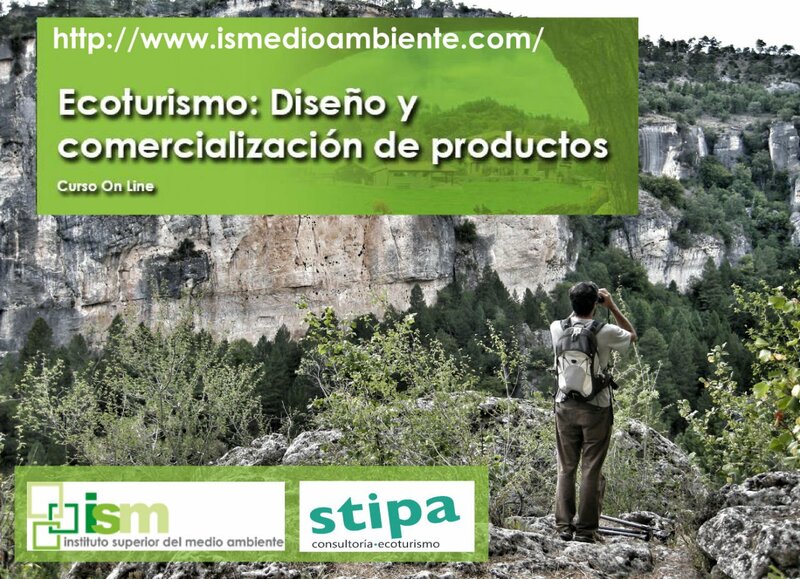 STIPA's team and Gonzalo de la Fuente del Val in collaboration with the Superior Institute of Environment (ISM) has designed this course which aims to develop ecotourism products that cumply with objectives of innovation, competitiveness and sustainability. We want to open new perspectives of ecotourism business in Spain, such as urban ecotourism, ecotourism in protected areas or not, the active responsible ecotourism or ecotourism linked to private areas through land stewardship agreements. Always under the premise of creating product and work collaboratively to improve the brand image of a destination. The course of Ecotourism: Design and marketing of products beginning on June 17, is taught entirely ON LINE through the ISM Campus and it has a duration of 80 hours and a total price of 260 euros. Good afternoon Nuria Chacon. I'd be very interested in following such a topic (Ecotourism-design and marketing producys) in english. So, please, keep me and the rest of the members updated!!! Thank you in advance.